It has been a busy summer but one that included a week at a small lake north of Grand Rapids. 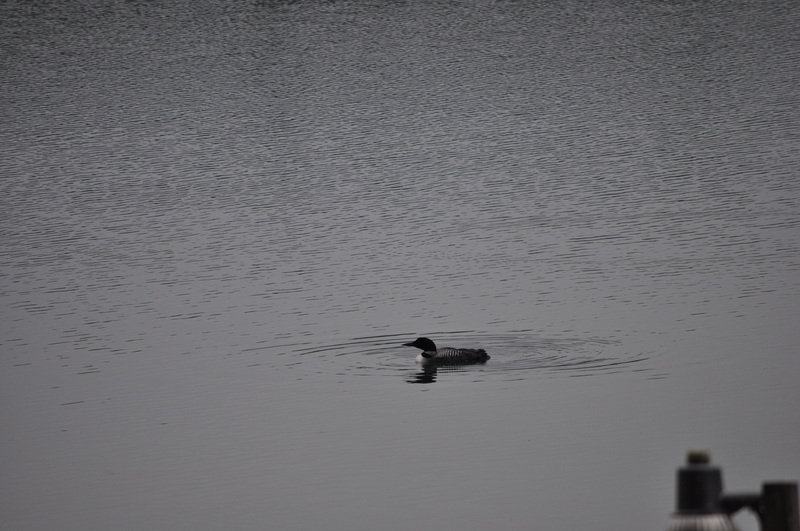 It is a very pretty lake surrounded by the Pere Marquette forest, home to lots of wildlife. 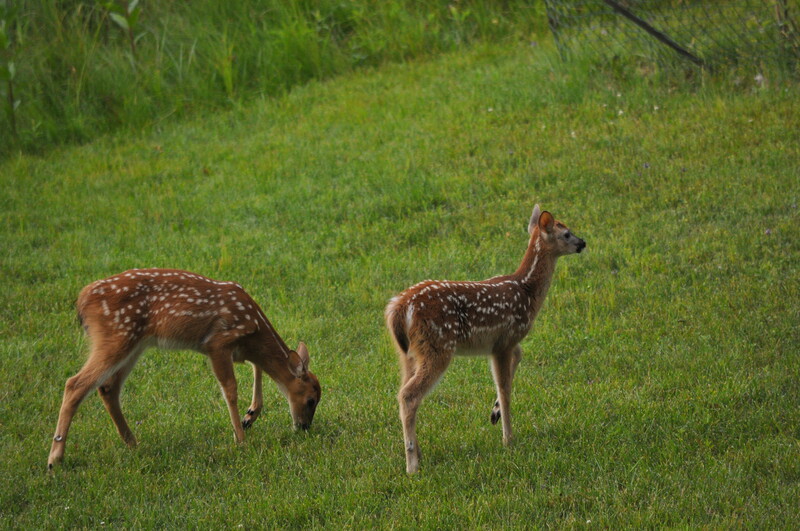 I was always the first one up and while having coffee was delighted to see two cute twin fawns. They came by the cottage several times. No one else in the family ever saw them. Oh well, they should have gotten up early too. 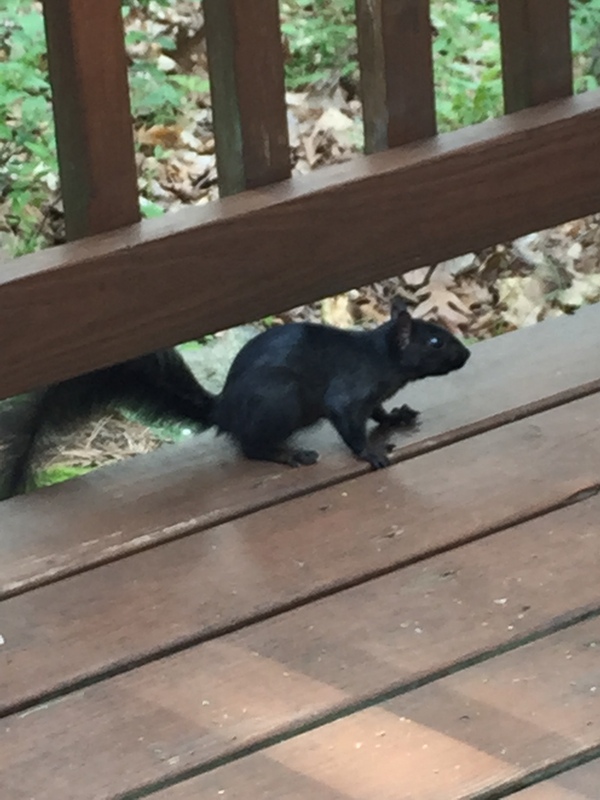 Loons and herons came around the dock everyday and a black squirrel showed up on the deck several times. 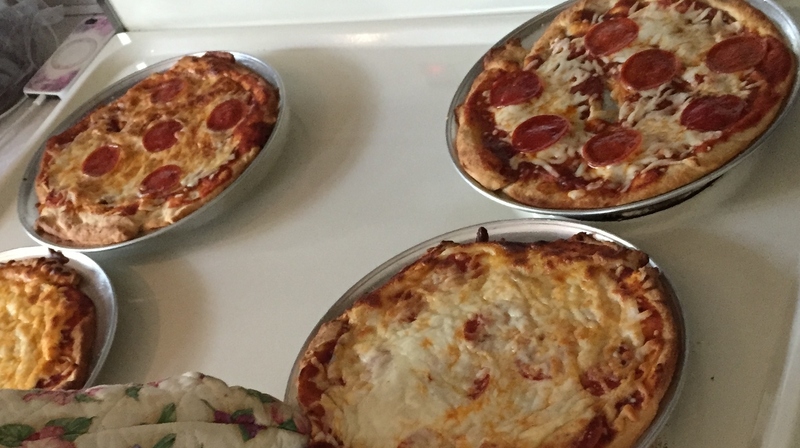 It was a fun family getaway with lots of good grilled food and one night homemade personal pan pizzas were on the menu. 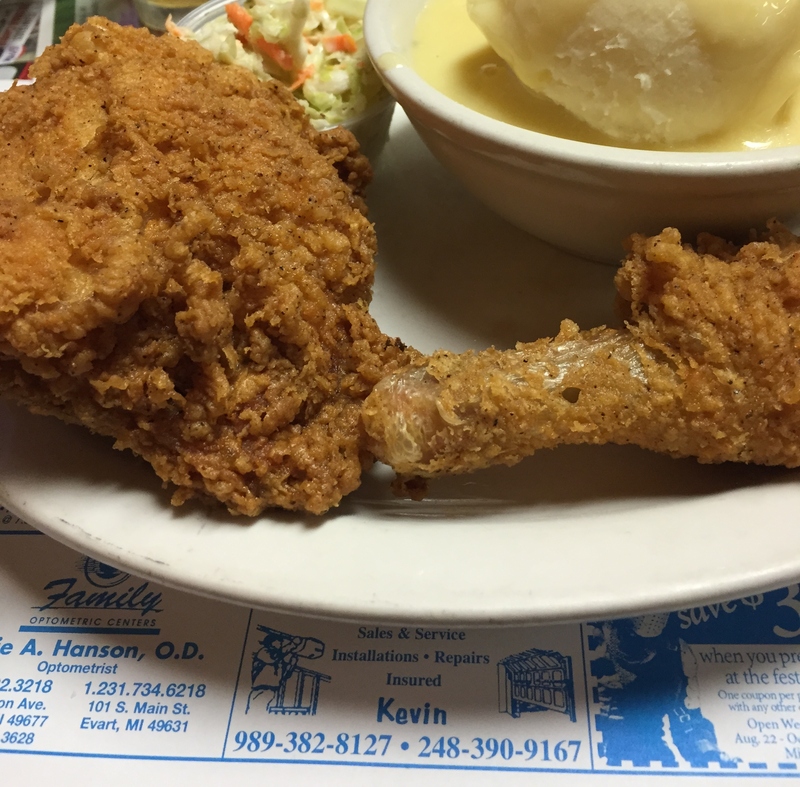 On a day trip we discovered Mr. Pibs Restaurant, a country restaurant that has the best fried chicken. It is actually chicken cooked using a pressure fryer and is chicken at its best. Mr. Pibs Restaurant is a family style restaurant located on the White Pine Trail in LeRoy, Michigan. It is home cooking in a down to earth family diner. This restaurant is way out in the country and the patrons are locals and farmers from the area. Now it seems like the end of summer is here, especially with it being September. But it is not too late to have a cookout before summer’s end. 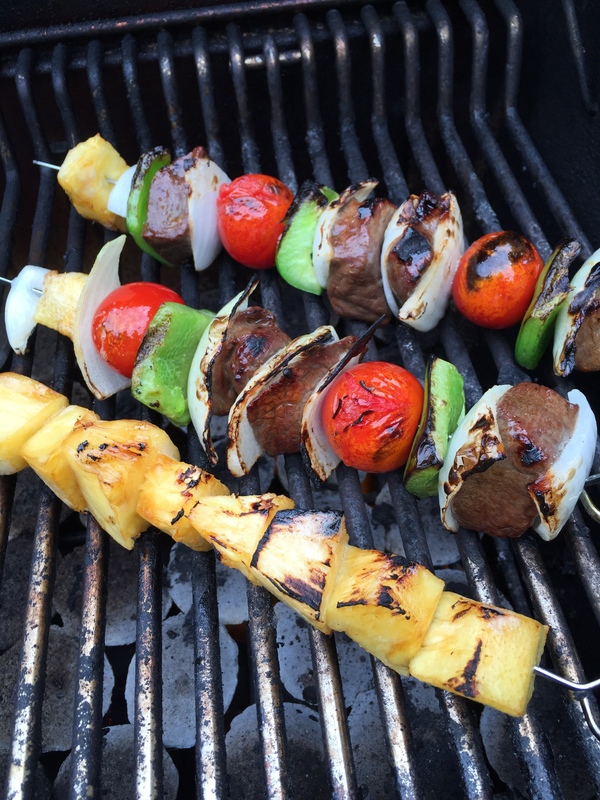 Grilled beef kabobs are a family favorite. Beef kabobs consist of small pieces of meat and vegetables threaded onto skewers and grilled. I very seldom order kabobs in a restaurant because the beef is usually overcooked, dry and chewy. That is why I like grilling them myself at home. 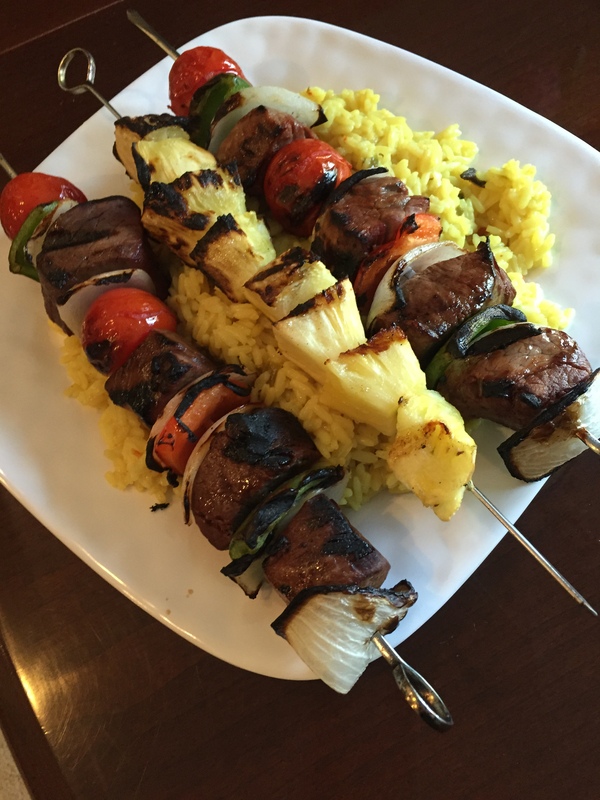 If you are looking for something different to grill for the upcoming Labor Day holiday, these kabobs are easy to prepare and perfect for a cookout. True shish kabobs are often made with pieces of marinated lamb but I believe that beef is the meat of choice in the USA and that is what we prefer. Cut beef into 1-inch cubes and place in a large zip-loc plastic bag. Pour 1 cup of the teriyaki marinade over the beef cubes. Press air out of the bag and close top securely. Turn bag over several times to coat all pieces of the beef. Refrigerate 2 hours, turning bag over occasionally. 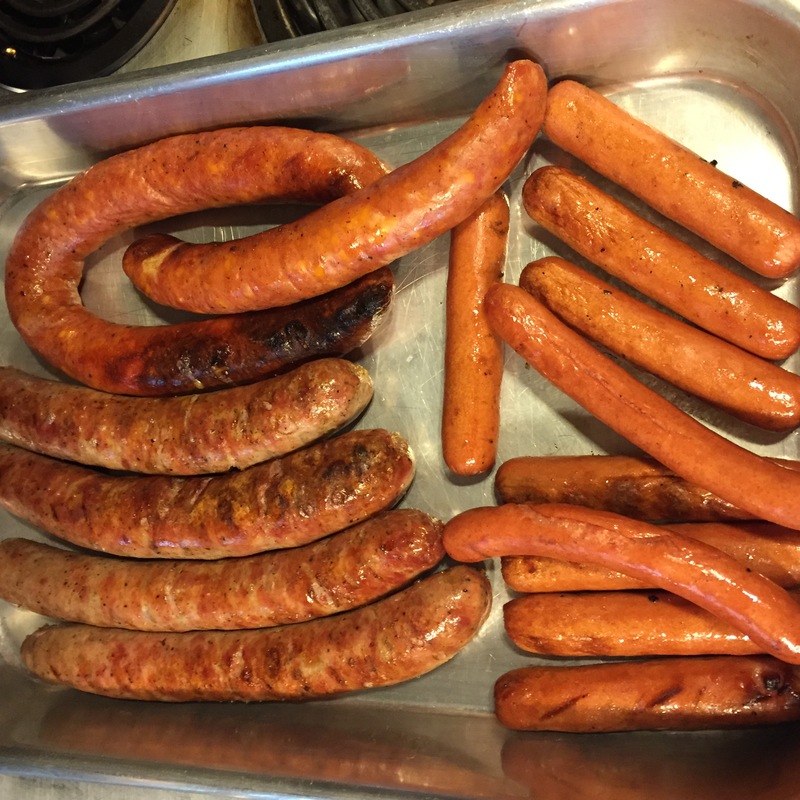 When ready to cook, preheat a gas grill to medium-high. Alternately thread beef and vegetables evenly onto 12-inch metal or bamboo skewers. Thread the pineapple chunks on a separate skewer. Grill the kabobs and pineapple over direct medium high heat until cooked to desired doneness, 7 to 10 minutes, turning once. Serve with yellow rice if desired. 1. If using bamboo skewers, soak the skewers in water at least 30 minutes to prevent burning on the grill. 2. Allow the kabobs to come to room temperature before grilling. Key lime pie is an American dessert made of lime juice, egg yolks, and sweetened condensed milk baked in a pie crust. It is named for the small Key limes that were once abundant in the Florida Keys. But you don’t have to use the very small Key limes to make this pie. The regular limes found in your grocery store are perfectly fine to use. I have only seen Key limes at my local grocery store a couple of times. 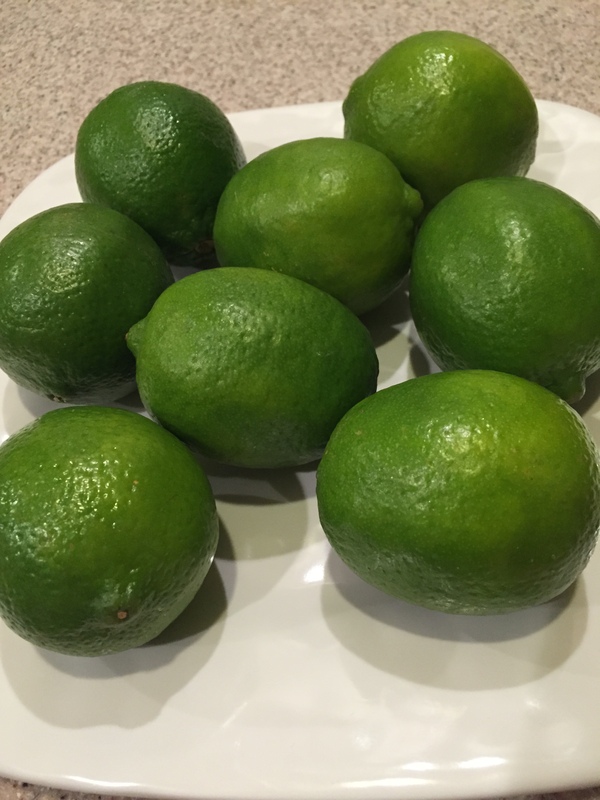 The Key limes are very small, about the size of a ping pong ball, and do not look like they would be fun to squeeze juice from. For this recipe, I used regular limes grown in Mexico that are available year round here in the USA. The first Key lime pie I ever ate was in the Florida Keys many years ago and I have loved it ever since then. It is a wonderful tart and sweet summer pie. 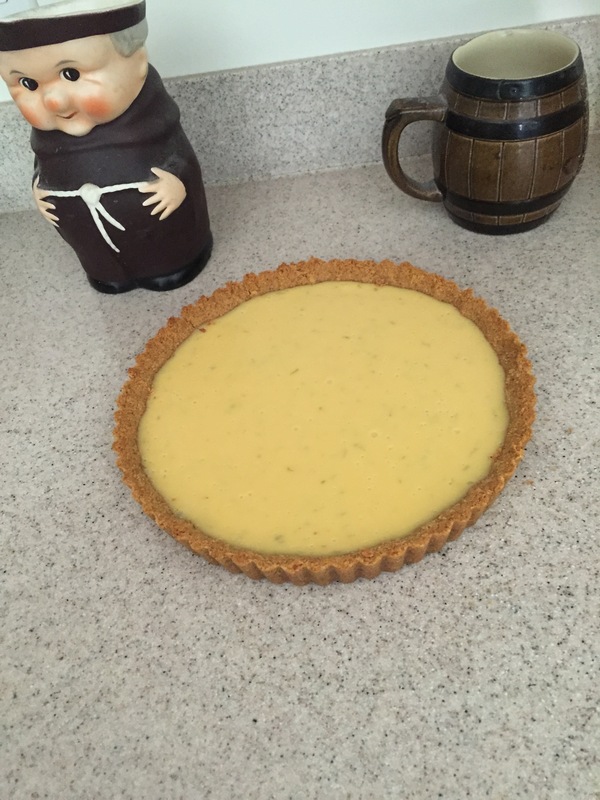 It is generally thought that a cook named Aunt Sally from Key West made the first Key lime pie sometime in the late 1800s, using a recipe created by local area fishermen as her guide. The other key ingredient in this pie is sweetened condensed milk which was invented by Gail Borden in 1856. 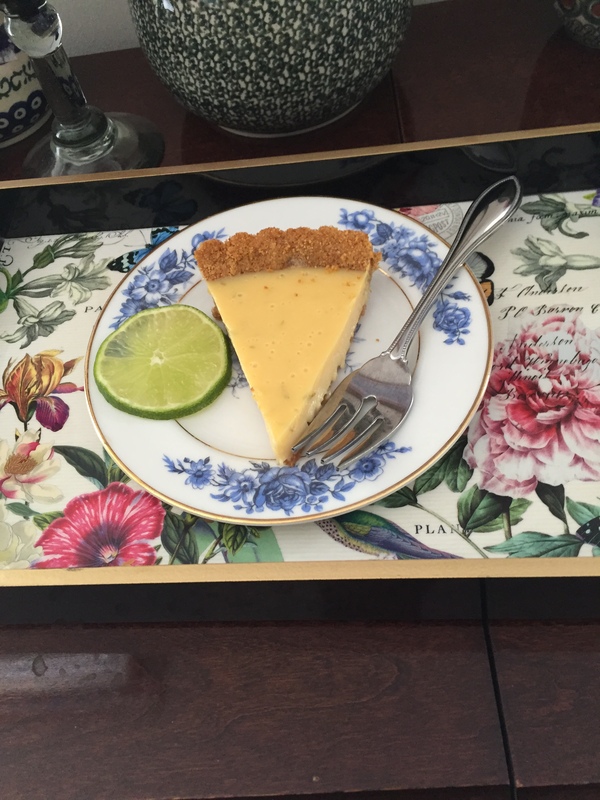 For more on the history of Key lime pie read the full article by Linda Stradley found here. The graham cracker crust recipe is adapted from the one on the back of Keebler’s Graham Cracker Crumbs box. The pie filling is adapted from The Pioneer Woman and her original recipe can be found here. Combine crumbs and sugar in medium sized bowl. Stir in the melted butter until thoroughly blended. Pack mixture firmly into a 9 inch pie (or tart) pan and press firmly to bottom and sides, bringing crumbs evenly up to the rim. Bake in a 350 degree oven for 6-8 minutes, or until light brown. Cool on a wire rack. Mix lime zest, lime juice, and egg yolks in a mixing bowl. Add in condensed milk and mix on low speed until smooth and thick. Pour mixture into the prepared crust and bake until the center is set but still quivers when the pan is nudged, 15-17 minutes. Remove from the oven and allow to cool completely on a wire rack. Then refrigerate for at least 1 hour before slicing. 1. Bottled Key lime juice is available but I prefer using fresh regular limes. 2. Because of the small amount of filling this recipe makes, it is perfect for a tart pan, but I have used a regular pie pan in the past. 3. This pie is perfect as it is but can be served with whipped cream.